Finahub Official Blog: 100% improvement in site performance after a data center movement. 100% improvement in site performance after a data center movement. It goes without saying that having your data centers and hosting servers close to your clients gives the best performance. This is not always feasible for companies using cloud services, especially for companies with a client base in India. Often the cost of hosting and bandwidth can be lesser for cloud services with data centers located in the US than for other locations. For startups, this opportunity to save little money can look tempting and many, like us, will opt for this less optimal configuration. But what is the real cost the companies are bearing for this? We were using US North Virginia data center of AWS (Amazon Web Services). All our clients are based out of India still we were still using the same data center as we were getting decent browsing speeds. The initial reason to pick that data-center was, it was the cheapest regions available inside AWS. Our application has an integrated bulk emailing service for our clients. The max speed we were able to achieve when we use an email server hosted in India was just 5 email per second. 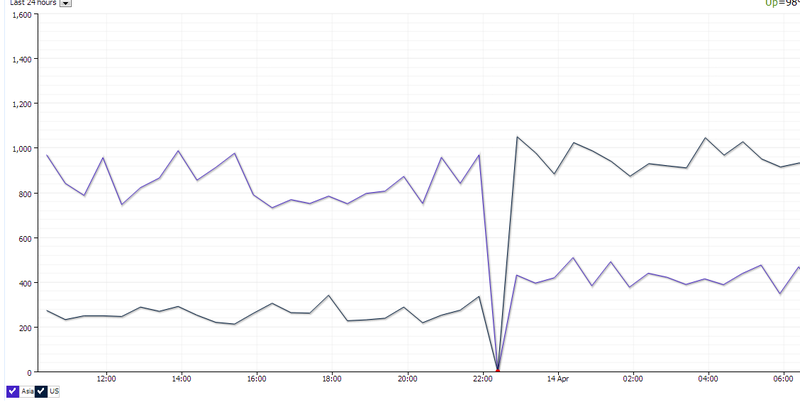 At the same time, we were getting speeds up to 15 emails per seconds when using email server within the US. This prompted us to investigate more on response times. We were getting an average response time of only 900ms from India and 300ms from the US. Thus we decided to move the data center to Singapore which is very close to India geographically. After the data center moves to Singapore, the graphs just swapped its positions giving 300 ms average from India. This is evident in the below site monitor graph. The sweet part is that the email sending speeds we used to get jumped to more than 10 emails per second. That is more than 100% improvement in performance. This meant that it took only 15 minutes to send 10000 emails and it was more significant in cases where reports were sent to all the customers of our customers. This made our customer very happy and this meant a lot to us. We see the extra money we are having to spend as an investment in client satisfaction. The lesson learned is that being frugal is fine but it should not be at the cost of customer satisfaction. If shelling out few doughs is going to make your customers life easier, it is better to do it than not. It will reap good rewards in the long run.